Of course we already know that your metabolism decreases and increases in weight with age. Indeed, aging can not be avoided, but there are exercise and eating patterns that can discourage it. Do not forget breakfast. Breakfast will raise your metabolism and keep it high throughout the day. Not surprisingly, people who skip breakfast actually 4.5 times more at risk of overweight. If no time for breakfast, drink oatmeal breakfast plus yogurt or low-fat milk. Drink green tea. Caffeine found in coffee and tea. Caffeine is a nervous system stimulant, so it can raise the metabolism of five to eight percent. According to a study in Japan, a cup of green tea can increase metabolism by 12 percent. The researchers believe that the catechins in tea can speed up metabolism. Enough eat you need to cut calories to lose weight, but too low in calories also endanger your metabolism. 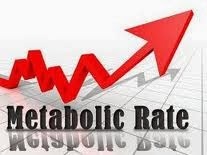 At that time the body will put the brakes on your metabolism, and begin to burn muscle tissue to be used as energy. Therefore, do not diet too strictly. Eat a snack at 10.00 and in the afternoon between meals to start the engine of metabolism. Drinking cold water. The German researchers found that drinking six cups of cold water can increase metabolism to less than 50 calories a day. It's enough to wipe out 2.5 kilograms a year. Why is that? The body requires energy to heat cold water to conform to body temperature. Organic lifestyle. The study from Canada reported that too many toxins cause difficulty in weight loss. Perhaps because of toxins involved in energy combustion process damage the body. Other studies reveal, pesticides trigger weight gain. Therefore, stay away from toxins. If possible, buy fruit and vegetables are grown naturally or organically. Eat iron. Iron is needed to carry oxygen needed to make muscles burn fat. Add iron in the body by eating fat-free meat, beans, and spinach. Add vitamin D. This is a vitamin that is needed to maintain metabolism. Add a vitamin D by eating tuna, shrimp, tofu, eggs. Drink milk. There is evidence from studies that calcium deficiency can slow down your metabolism. The study also revealed that consumption of calcium through milk or low-fat yogurt can reduce fat absorption from other foods. Do not forget protein. The body needs protein to maintain muscle health. Eat fat-free meat or fish as a daily menu. Proteins can burn calories to 35 percent.